1. 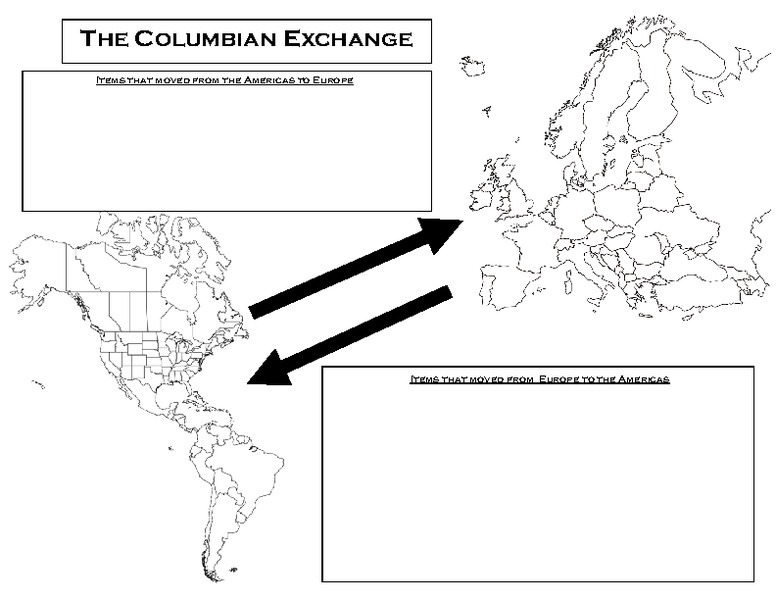 What is the Columbian Exchange? 2. What role does slavery play in colonization? 3. Who benefited most from colonization? 4. What is an import and an export? 5. How does the Global economy impact your life? The unit presented here opens with the Columbian Exchange which introduces the exchange of goods, disease, and culture between Europe and the Americas. It progressed into trade triangles between Europe, Africa, and the Americas. Encompassing the slave trade, the global economy, and colonization, it drives students to make connections between aspects of the contemporary global market. As a way to introduce the unit, I started off showing the students a three minute video about imports, exports, and the brief history of international trade. The School House Rock video featured to the right was a hit with the students! To kick start the unit, I distributed the worksheet pictured below and instructed my students to look at the board where I had a comprehensive list of goods from both Europe and the Americas. I then directed the students to fill in the boxes on the worksheet to indicate which goods and diseases derived from which continent, such as corn, horses, fruits, etc. By having the students complete this activity, I gained a better sense of their prior knowledge before embarking on the new unit. This activity served as a good baseline for my instruction and geared their learning at a sufficient pace. One of the major discussion points at the beginning of the unit was the pros and cons of the exchange and if the Columbian exchange was a good thing or not for both the Americas and Europe. 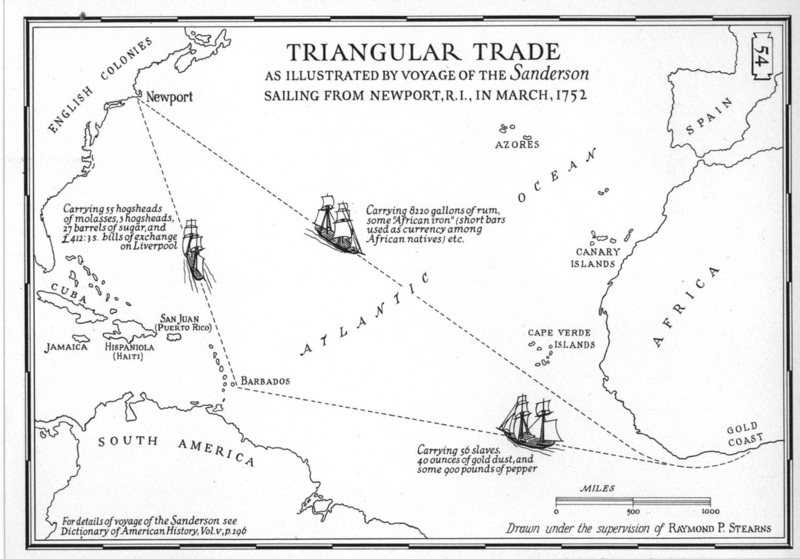 Another part of the unit was the triangle trades that occurred between Africa, the Americas, and Europe. The map shown to the right explains the various goods transported among those three continents. It conveyed to the students how interconnectivity took place even in the 1700s. It also illustrated how the global economy operates on a smaller scale. Lastly, it introduced slavery from a different perspective than students were accustomed to in previous history classes. Teaching the students with a cross-curricular initiative was important for me to emphasize not only social studies but also writing. As of the most important aspects of the secondary curriculum, I infused writing as a key component throughout my unit. One of these activities encouraged the students to place themselves as a person living in colonial times and create a journal entry as one of those people. The journal prompt asked the students to take on the role of an indentured servant, African slave, tribal leader, or European trader and give a one page experience relating the goings-on in the new culture that they encountered. This activity not only included the content that I taught, but it also allowed the opportunity for a creative outlet for the students who were more creative learners. In order to make sure that the students were comprehending the bulky content of the unit, I included various methods of assessments to gauge student learning. One of the aforementioned assessments was the use of exit slips, as shown here below of student evidence of learning. The culminating project for this unit entailed the students looking at data from the United Nations regarding imports and exports. 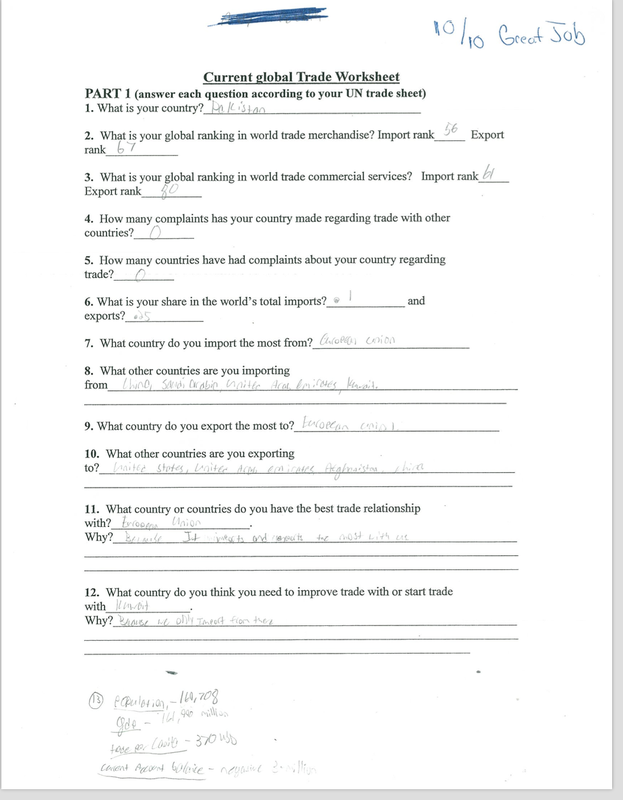 I distributed a worksheet for the students to complete and the students used their research skills to navigate UN websites to find pertinent information about trade. Working closely in small groups, the students applied their knowledge about trade and its inherent impact on the global economy. By incorporating the contemporary aspect of UN trade, the students were able to make connections between the past and present, which enhanced their overall understanding of the unit. 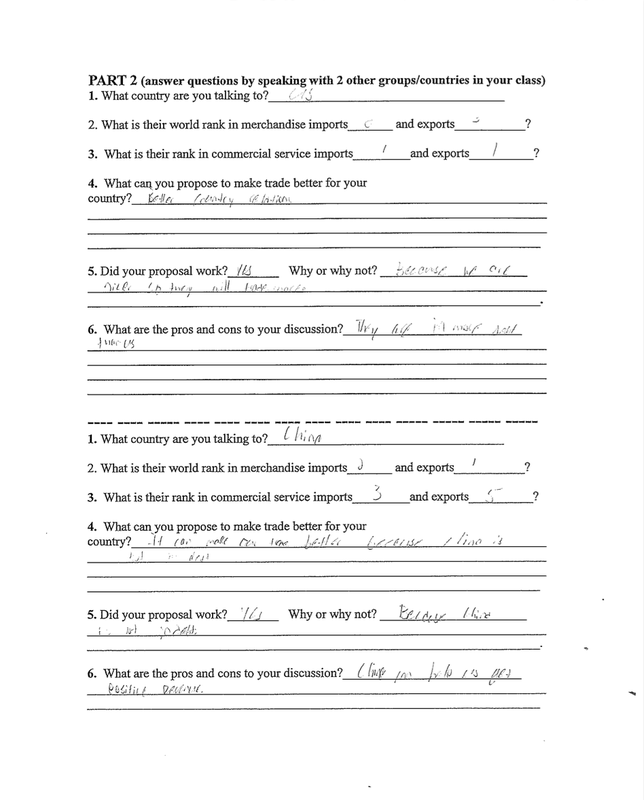 Below is a sample assessment from one of the students who completed the culminating project. This lesson has been one of my best to date. It has also been one of my most simple lessons as well. I was a little surprised by how engaged the students were throughout the whole thing. They seemed to turn it into a competition. The students did their best to get more guesses right than their classmates. I was even more thrilled to see how much they enjoyed the School House Rock video clip. I enjoyed them so much as a student that I decided to use it as a teacher and made me feel good to hear students still singing the song on their way out of the room. I will definitely use this lesson again in the future.